Reid had threatened to use a parliamentary tactic, available only on the first day of a new congressional session, to change Senate rules with just 51 votes when a supermajority of 67 is typically required. Republicans fiercely oppose the tactic they call the "nuclear option" and said it would lead to a meltdown of comity in the chamber. But with negotiations now underway between Reid and Minority Leader Mitch McConnell over a possible compromise, Reid has decided to hold off forcing the change, at least temporarily. An aide explained Reid will use a technical parliamentary procedure that will keep the first legislative day open indefinitely as talks continue. That way if the talks fail, he would preserve the right to make the change with just 51 votes. Democrats argue Republicans have overused filibusters and created dysfunction in the Senate. Republicans counter that they rely on filibusters to stall action on bills because Democrats routinely refuse to allow GOP amendments. I have a very bad feeling that absolutely nothing is going to change and the 60 votes needed to buy toilet paper for the Senate washrooms will continue in place ad nauseum. Once again – there will be no new chapter added to Profiles in Courage. I've never seen or even imagined such a bunch of gutless wonders. Note to Congress: You work for us, not the Koch Gang. The Tea Party is just a very noisy bunch of brats having a tantrum. Get some of thse "moderate" Republicans to vote in the primaries and your problem is solved. Sure – what was McConnel's excuse when he filibustered his OWN bill/request?? This NEEDS to be reformed – Reid – GO FOR IT! Senate needs to be able to work! Sounds like Harry has ole Mitch in between a rock and a hard place! To bad the hardline GOP- ers don't like playing hardball when the tables are turned. Wonder what a compromise will look like!!! What's that old saying "Give him hell Harry"....doesn't sound like the speaker likes you to much either! This nation needs to pass senate/congress Term-Limits, Filibuster reform, voter reform, stringent immigration reform. We need to watch number of people coming from India–these guys are Not going back–getting married here and abusing the system–in a long run it hurts this nation. Reduce the number of immigrants. Comity? What comity? There ain't no stinkin' comity. Wth. He already trust mcconals word last wime. What is reid thinking. The filibuster is a bad deal. It's always good for the party not in control, but it's too easy for them to stop anything from happening, even if the majority of Americans want it done. That's exactly what the GOP has done, and one of the big reasons nothing was done in this Congress, the worst record in history. Perhaps we keep it, but make it a limited category in the types of things that can be filibustered and require they speak the entire time, with no breaks. This rule change needs to happen Yesterday! we have people who want to destroy our government keeping it from functioning at all because they have just enough votes to stop anything they don't like. this is not democracy. and if these clowns want to filibuster everything that comes along, they should be made to actually get up and talk till they drop, like the good old days. beter yet, just vote out the people who don't believe in a functional government and let the folks who understand the true function of government actually govern. the rethugs don't have a clue what government is for. time for them to all go home. Why wouldn't the party of "No" be opposed to any kind of legislative change that doesn't involve fleecing the middle class for the benefit of their corporate bosses. Then the amendments must come up for debate in the senate and win 60 votes or they fail. if any succeed the bill is amended and then goes to final debate and may pass with a simple majority. Amendments coming from committees with more than 9-6 votes must be debated, those with 9-6 may be grouped at the majority leaders discretion into batches for a single vote. Repeal amendments or those throwing out the core of the bill) are not allowed, either in committee or the senate in full. The Republicans have done nothing but filibuster. If you need to rely on filibusters to stall actdion on Democratic bills, I'm guessing these bills were to help the middle class. The GOP has proven they hate the middle class. They need to be purged from the political landscape until they get rid of the hard right wingnuts controlling their party. Then and only then will they be fit to rule. Ronald Reagan must be spinning in his grave to see what a hot mess his party has become. The filibuster has.been abused and is no longer used as originally intended. Reid is right in wanting to bring it back in line. Filibusters must require the senator making the objection be present on the Senate floor. Non-germane amendments should not be allowed except in extraordinary circumstances. The American people are fed up with this nonsense. It is way past time to get down to the business of legislating through compromise and debate in the light of day not behind closed doors in secret deals. Ah, exactly what the founders had in mind when they so carefully sculpted the Constitution... for the majority to simply silence the voices of the minority. Reminds me of how they put in place a series of obstacles for any one Congress or administration to undo any amendment to the Constitution, as a deterrent against the emotional pleas of the masses or for political gain. But, alas, those were the good old days. Today we truly live in a dictatorship, where the ruling class gets to say what's a right (healthcare, unlimited free unemployment, student loan and home mortgage forgiveness) and what rights really shouldn't exist anymore (the right to defend yourself, the right for the government not to interfere in your religious beliefs, the right of states to exercise powers not dictated explicitly for the federal government). Harry Reid is one of the most dangerous men in the US Senate..........he is so liberal that he reeks of Socialism. it is his way or the highway and the American people be damned. He and the other ultra liberals of the Democratic Party are so anti-Middle Class that it is scary, yet they spout off rhetoric where they try to make it appear that they are pro-Middle Class........they are absolute liars and cowards! If he and others had their way we would throw the Constitution out the door and tear up the Declaration of Independence. He wants to appear to tax the ultra rich yet he takes their campaign contributions with no shame.........what a sorry excuse for a human being and a real threat to the future of our Republic!! If they want to filibuster then let them stand and speak and debate and then let the Senate vote. When McConnell filibustered his own bill that showed America that Republicans still don't get it. If you're going to Talk the Talk then man up and Walk the Walk. Republicans filibustered more bills during just one year of Obama's presidency then all the filibusters put together during the entire history of Congress. They is blatant abuse. The GOP is using the filibuster in a clear act of blind obstructionism. They even filibuster their own bills. I applaud Harry Reid for playing HARDBALL with obstructionist Republicans. No Constitution-loving, patriotic American would tolerate any party resorting to grinding our government to a halt, yet this is what the GOP has done time and time again. Then they envoke the term "nuclear option" as if it is the Democrats that are the extreme ones. Talking about defaulting on America`s debt was EXTREME [read: nuclear]. It resulted in a downgrade of our credit rating. Gingrich shutting down the government [in 1994 I think] was EXTREME [read:nuclear]. So the GOp has a hell-o-va-nerve to whine now. The Democrats need to do this for the American people so that the chamber functions as we expect. 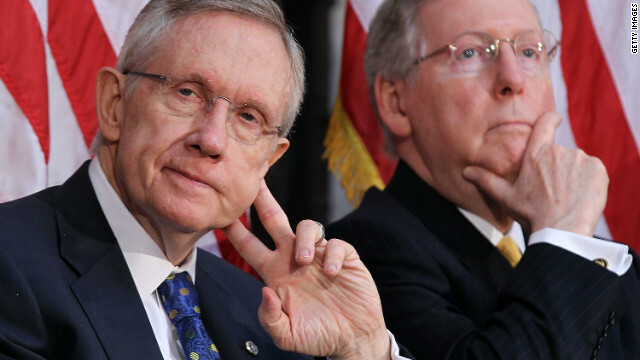 NUKE`em Harry and force some accountability & visibility on obstructionist Senators.